Clarence "Cip" Paulsen III is no stranger to risk. He used to hang out with Evel Knievel, but that ended in 1989 when the two got into a scuffle at the Ridpath Hotel. He used to distribute massive quantities of cocaine, but that ended in 1995 when he was sentenced to 14 years in federal prison. Now he is one of Washington's 400 licensed legal-marijuana producers and the proud owner of 35,000 thriving marijuana plants. At 56, Paulsen radiates the sort of energy and excitement typically associated with youth. But behind the devil-may-care, fun-guy facade — and few would deny that Paulsen is a fun guy — is a shrewd businessman whose wheels are constantly turning. If you hang out with him long enough, he'll start pulling you aside occasionally to offer footnotes on what he's thinking. How he plans to get the guy he was just chatting up to quit his job and come work for him; why he's planning to go to a certain bar next; what he thinks could be happening in the legislature right now. He's always calculating a couple of moves out, always preparing for the best and the worst things that could happen. 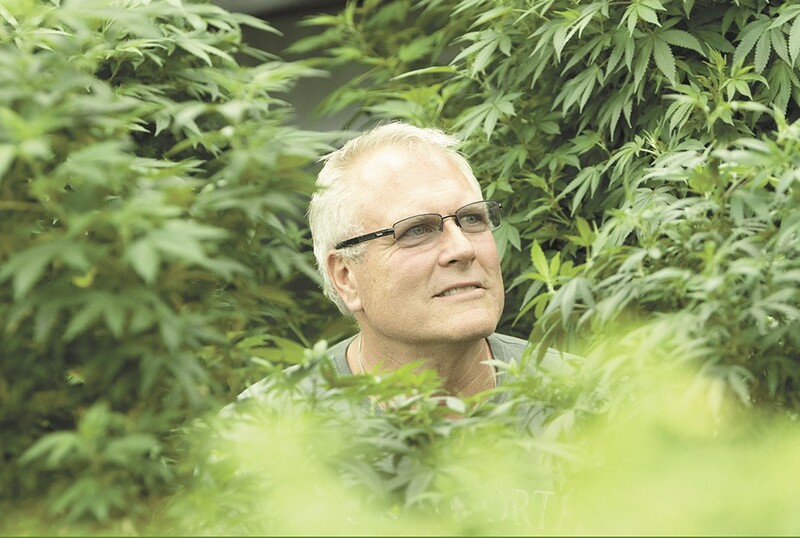 "I'm not a grower, I'm an information gatherer," says Paulsen, whose 21,000-square-foot, partially hydroponic marijuana grow, GrowState, currently employs 44 people. Paulsen comes from a wealthy mining family with significant real estate holdings in Spokane and Idaho, among them a 131,500-square-foot warehouse which had been sitting empty since Costco moved to the Spokane Valley. When Paulsen approached his accountant Paul Fruci with his plan to turn the warehouse into a tier-three recreational marijuana production facility — the largest you can have here — Fruci says he was skeptical. "A lot of people saw this new industry kind of like the gold rush," says Fruci. "There was an aura of easy money. A lot of those people have gone, or are going, broke." But Paulsen wanted to do it, so they raised the necessary funds — all from within Washington — and embarked on the roller-coaster first year of legal weed production. "We have had to get an extreme amount of knowledge in a very short time," says Paulsen. "There's still a big learning curve. You try and grab knowledge over here and over here and maybe learn. We try to use the best professionals in different aspects of our operation." Paulsen knew going into it that he wasn't an expert grower. "Cip's got his net worth on the line. That's a lot of motivation to learn fast," says Fruci. One thing Paulsen learned quickly was that the people with experience growing marijuana didn't necessarily have knowledge they could parlay into a large-scale grow. "Most of these so-called master gardeners have been growing in a 300-square-foot garage or basement," he says. "We're growing 21,000 square feet, so there's a huge difference." Paulsen's ability to juggle solutions to multiple potential futures has been key to his success so far. Laws and regulations are in constant flux and he's been operating without a blueprint. Everything has ended up costing more and taking longer than expected. Paulsen says he spent $175,000 on his 119-camera security system and his electricity bills are through the roof. "It sure was painted as a lot better picture than what it is," says Paulsen. "At first we weren't getting the whole story on how long it takes to grow, what the cycles are and how it works." Growers also were expecting to get twice as much for their product. Throw in taxes — growers are currently paying the equivalent of 46 percent — and the financial realities of the first year have been harsh. Only 160 of the 334 licensed retailers have opened up shop, so there are currently 400 producers competing to get their product onto far fewer shelves than expected. Paulsen says he's staying competitive by acting like a wholesaler, keeping his costs low and forgoing fancy packaging. His focus is on quality and efficiency, and he's been diversifying his product lineup to stay on-trend. "We have crumble, shatter, wax, fudge, oil, concentrates, it's just a never-ending learning thing," says Paulsen. "I've had to learn so much in the last year, it's just unbelievable, and I'm still not anywhere near where I want to be. We can always get better, and we will get better and better and better."